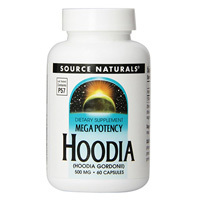 Source Naturals Mega Potency Hoodia is a dietary supplement manufactured by Source Naturals. It is one of the dietary supplements that Source Naturals has formulated for weight management and is considered by some dieters who want to buy Phentermine without a prescription. Although the actual supplement doesn’t make any claims about how it can aid individuals seeking weight loss, it is well known that hoodia is popular in the over-the-counter (OTC) weight loss industry because it is believed to be a potent appetite suppressant. When this review was written, Source Naturals Mega Potency Hoodia contained a single active ingredient: Hoodia gordonii Stem. There was 500 mg per 1 capsule serving. Users of this product are directed to take 1 capsule one hour before a meal with 8 ounces of water. Hoodia is a cactus plant native to the Kalahari desert in Africa. A long-time claim is that hoodia is ingested by San bushmen in Africa to help overcome feelings of hunger during long hunts when food is scarce. There are different types of hoodia on the market and not all of them are effective. In fact, according to some news reports, some hoodia products on the market don’t contain hoodia at all. That being said, the belief is that the best and most effective hoodia is hoodia gordonii, like the one found in this mega potency product. The reason is that only hoodia grodonii supposedly contains the chemical known as P57. It is this chemical which is believed to lower feelings of hunger and help with appetite suppression. The downside, however, is that it is unknown if hoodia has appetite suppression effects when used in people. In short, there is insufficient evidence in regard to hoodia suppressing appetite for weight loss. Further research needs to be conducted on the herb in humans to find out exactly what type of effects it has on weight loss (if any) and whether or not it is safe. Safety is the other issue with hoodia. It is entirely unknown if this herb is safe to take or what type of long-term effects it might have on the body. Due to there being absolutely no solid clinical evidence that hoodia, including hoodia gordonii, is effective or safe, it doesn’t seem sensible to make this dietary supplement a part of your weight loss regimen. If, on the other hand, you decide that you would like to give Source Naturals Mega Potency Hoodia a try, it would be a good idea to talk with your doctor about your plans first. This is particularly important if you are pregnant, nursing, have a current medical condition or are taking any other medications or dietary supplements.